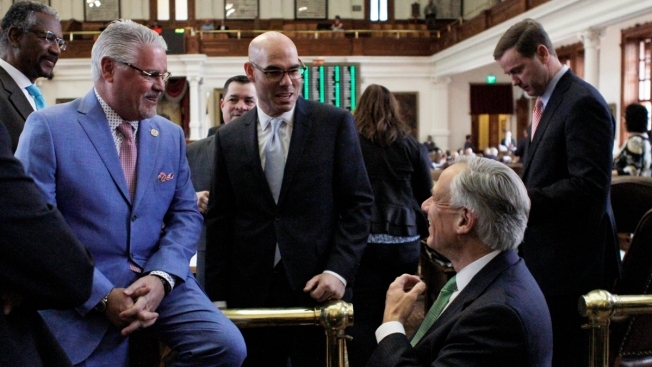 State Rep. Dan Huberty, left, R-Houston, speaks with Texas House Speaker Dennis Bonnen and Texas Gov. Greg Abbott, right, before the chamber debates a bipartisan school finance bill that would pour $9 billion into the state's public education system Wednesday, April 3, 2019, in Austin, Texas. The Republican-led Texas House has approved a bipartisan school finance bill that would pour $9 billion into the state's public education system -- lawmakers' latest attempt to revamp a funding structure the state Supreme Court has deemed barely constitutional. Disagreements over both issues during the 2017 legislative session left lawmakers unable to pass a measure that would have pumped $1.6 billion into state classrooms -- despite bipartisan support.